I haven’t done a blog post recently because, frankly, I haven’t been doing the most exciting/newsworthy things, I think. 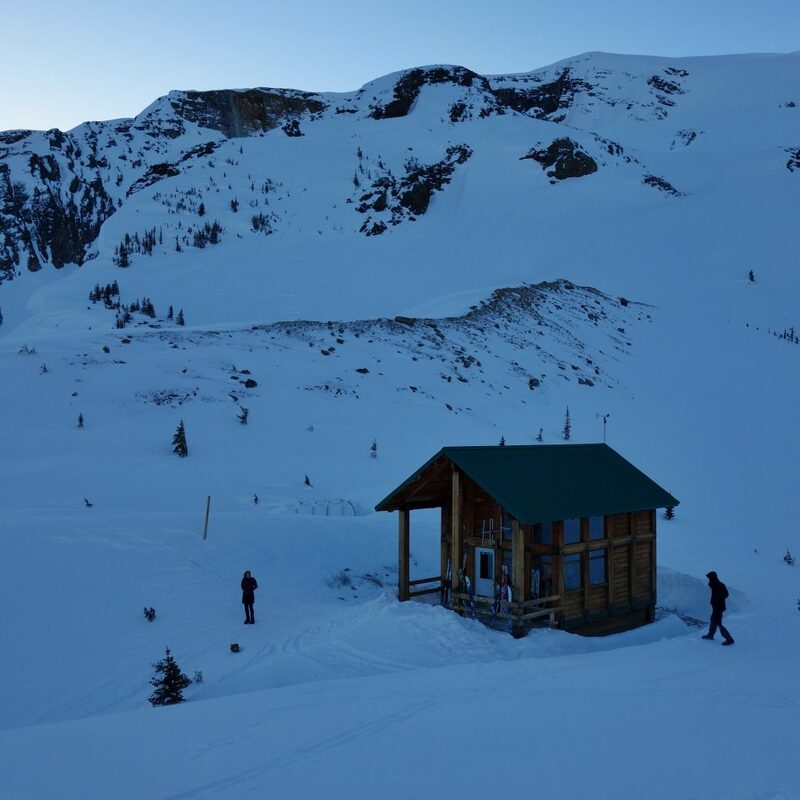 I did some pretty cool ski trips in the spring to Jumbo Pass Cabin and to Asulkan Hut in Rogers Pass, but I suppose I found myself “too busy” (a phrase I absolutely despise) to write about those. 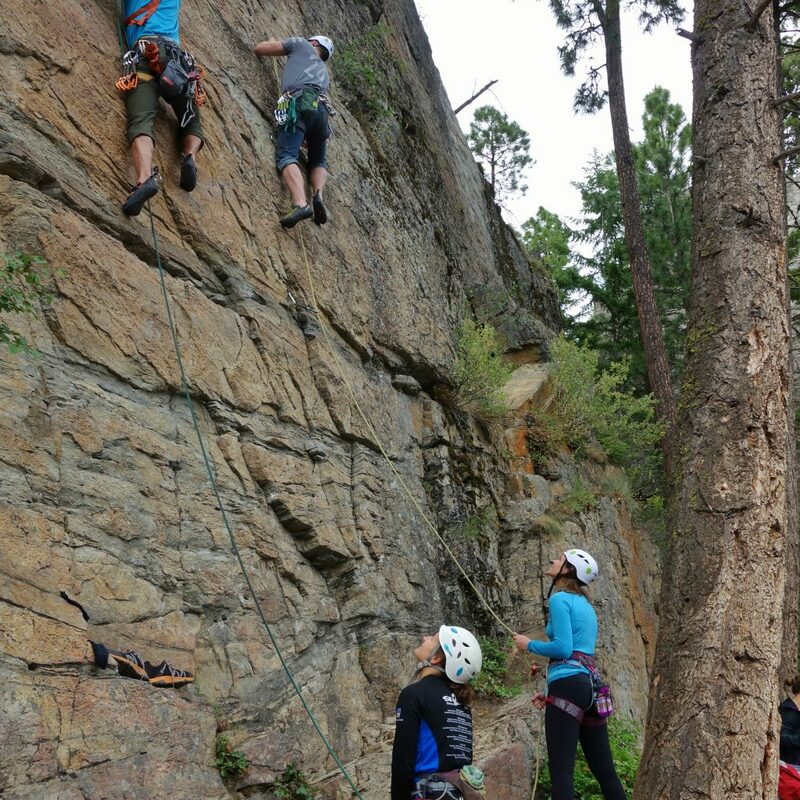 In May I went on a really fun rock climbing trip to Skaha with some great pals. 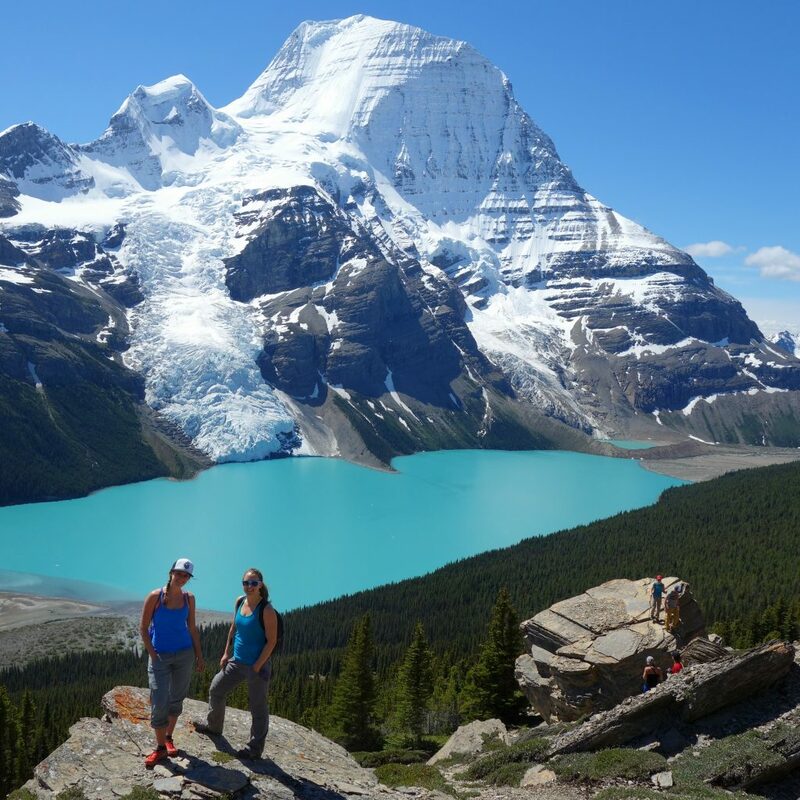 Then in the summer I busied myself with trail running, mountain biking, a backpacking trip to Mount Robson, rock climbing, plus a very exciting foray into uncharted waters (literally); kiteboarding. 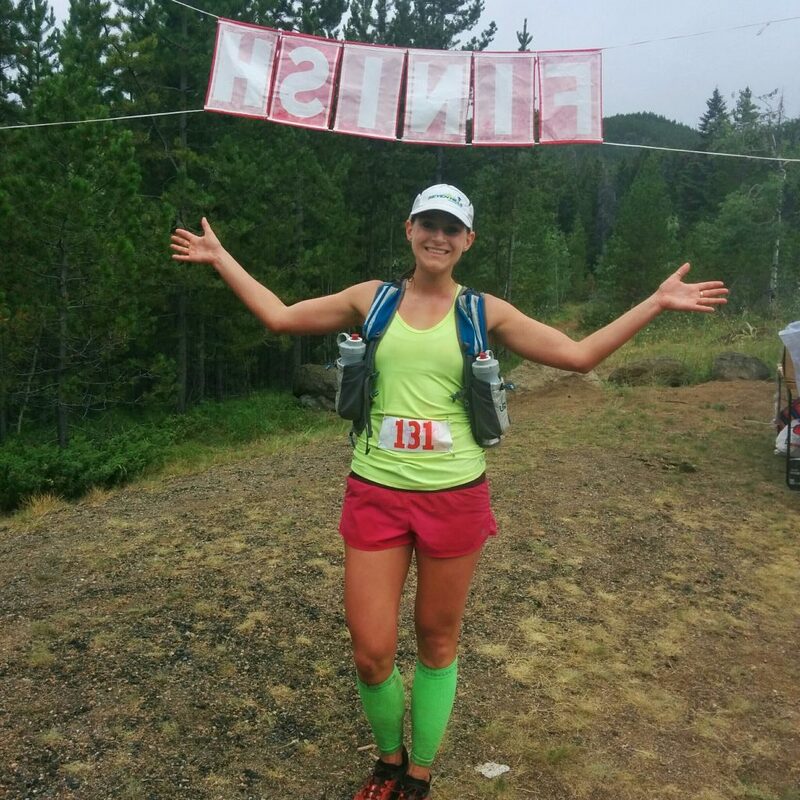 I also participated in two trail races – the local Powderface 42 and another in Montana called the HURL Elkhorn (50k). At the finish line of the HURL Elkhorn 50k race. OK so maybe it’s been more thrilling than I give myself credit for. 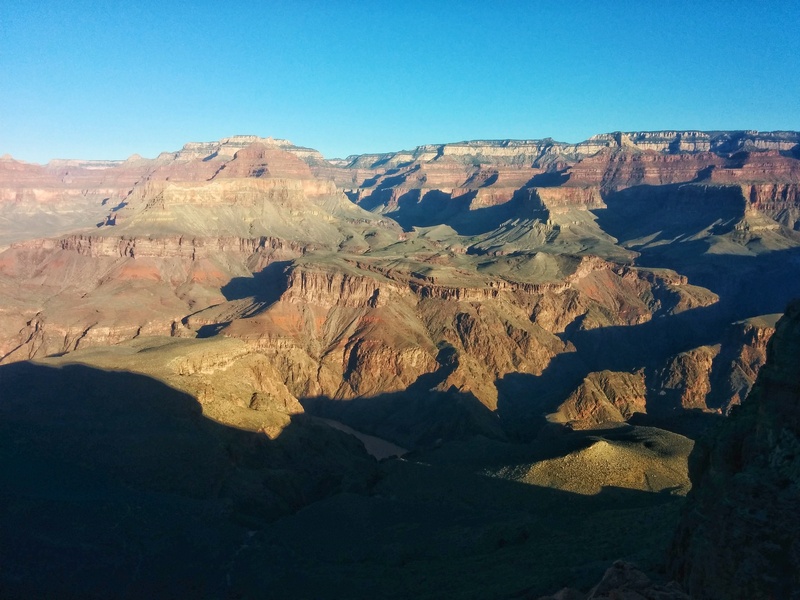 Anywho, I guess I only recently completed a bucket list project which I felt was worthy of blogging about: The Grand Canyon. 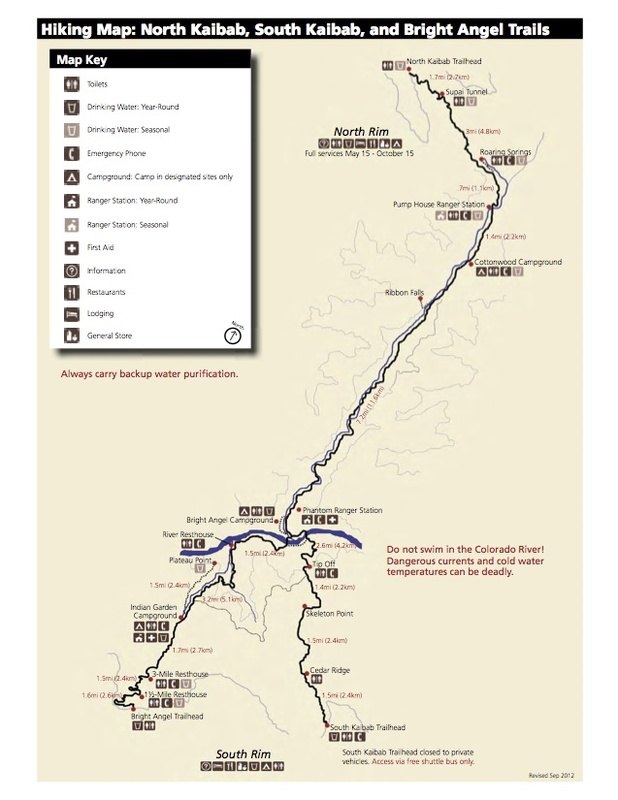 At the suggestion of my dear friend Seth, I set my sights on fastpacking the Rim to Rim to Rim (R2R2R) which is, round trip, about 76km with a net elevation gain/loss of ~6000m. 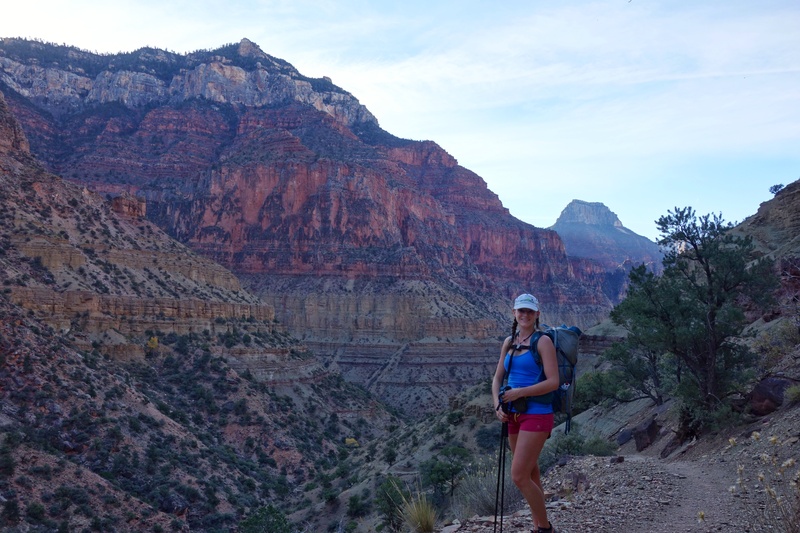 Taking into account a few factors including time of year, hours of daylight (and the fact that I wanted to actually see the Grand canyon), my usual pace minus my current fitness level (poor), time to take pictures, etc., I decided to do a fastpack over two full days. Just one month prior to my arrival, my gracious host in Flagstaff, Jim Walmsley had crushed the previous R2R2R record, running it in a mere 5:55. I had literally no hope of accomplishing a feat so amazingly fast, and was hoping for something more in the range of 16:00 hours (total moving time). Doing the trail over two days meant packing everything I’d need to overnight at the North Rim, where services had already closed for the winter, meaning extra pack weight which would further slow me down. 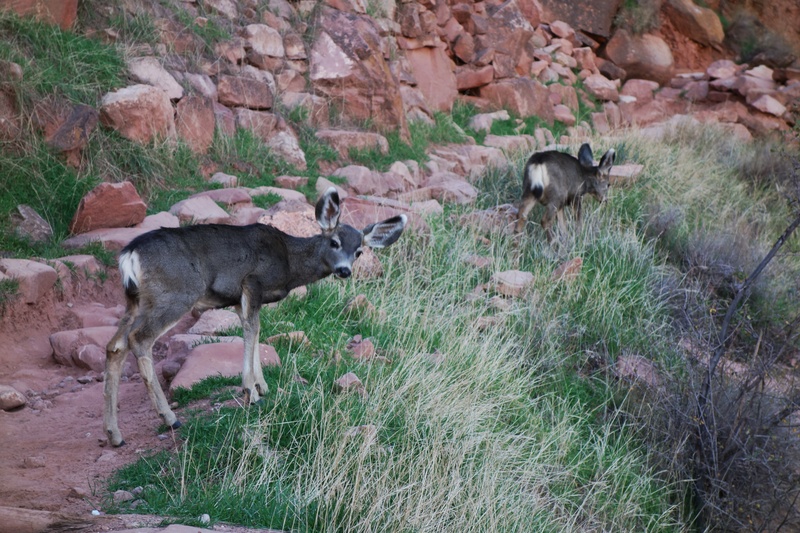 I stopped at Phantom Ranch for a bit of a lunch break, having previously been unaware that there are actual facilities here which sell snacks and provide full accommodations! Little did I know that people actually take mule trips down into the canyon and stay overnight in reasonably nice quarters. 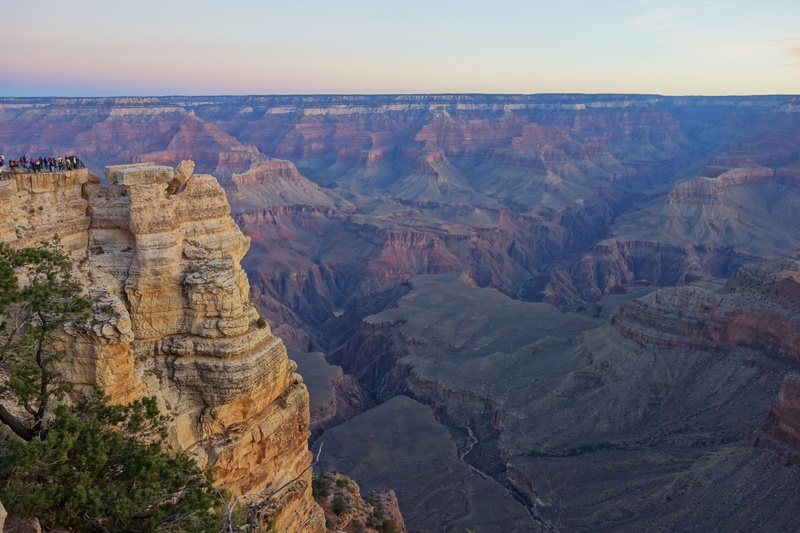 The canyon actually opens up for a bit before it narrows again and turns toward the North Rim. 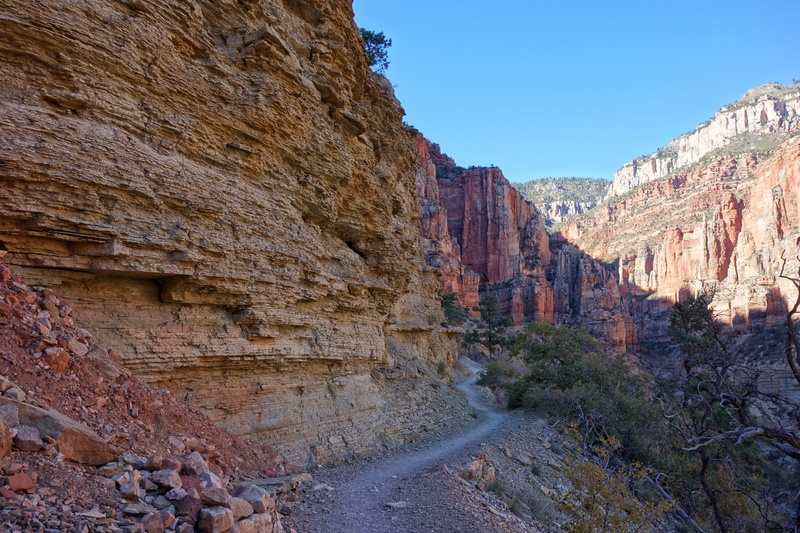 Starting to ascend the North Rim the Canyon narrows and the walls feel a little higher. 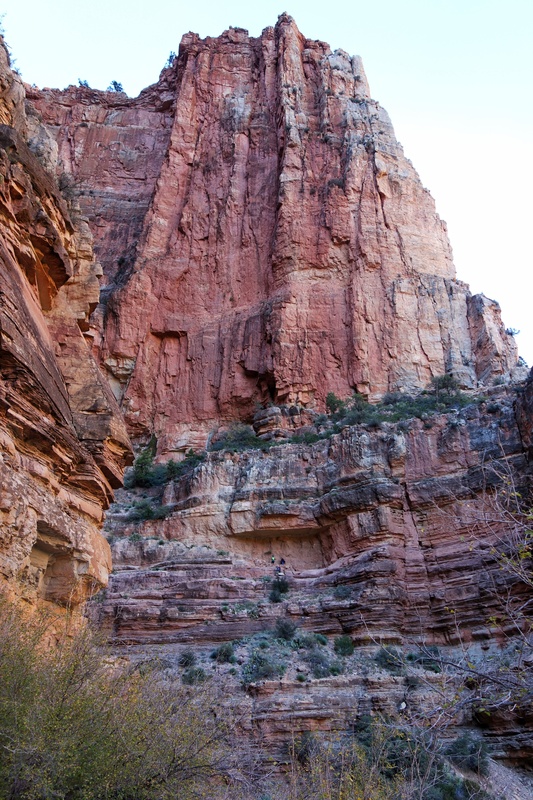 Zoom in on this shot and spot the tiny people perched inside the canyon wall. I reached the North Rim at just after 4:00pm meaning that my total travel time that day had been roughly 9 hours, including the time stopped for lunch, to take pictures, etc. 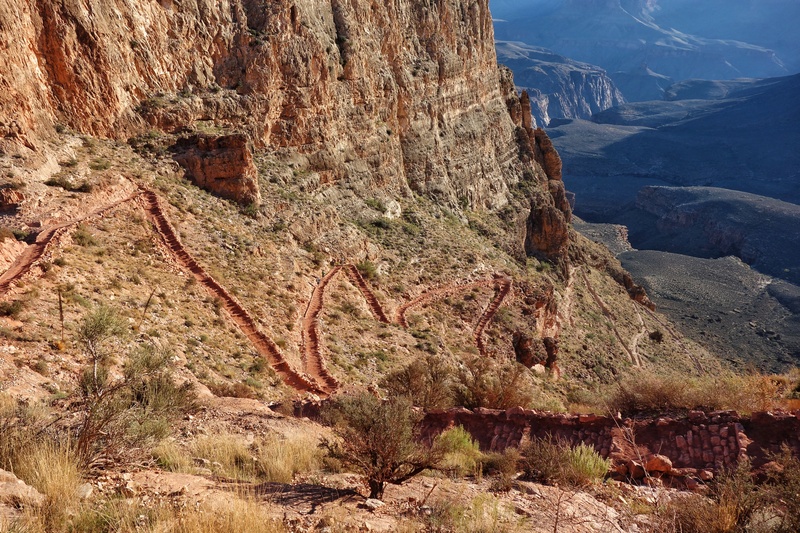 While I ran down almost the entire South Kaibab downhill until the Colorado River, I’d done very little actual running on the flats, and none whatsoever on the hike back up to the North Rim. 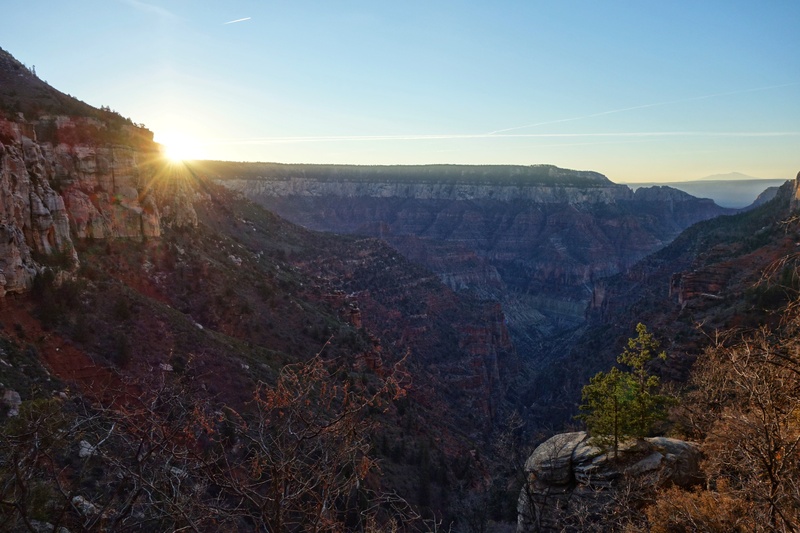 By the time I arrived at the North Rim the sun was already starting to set. 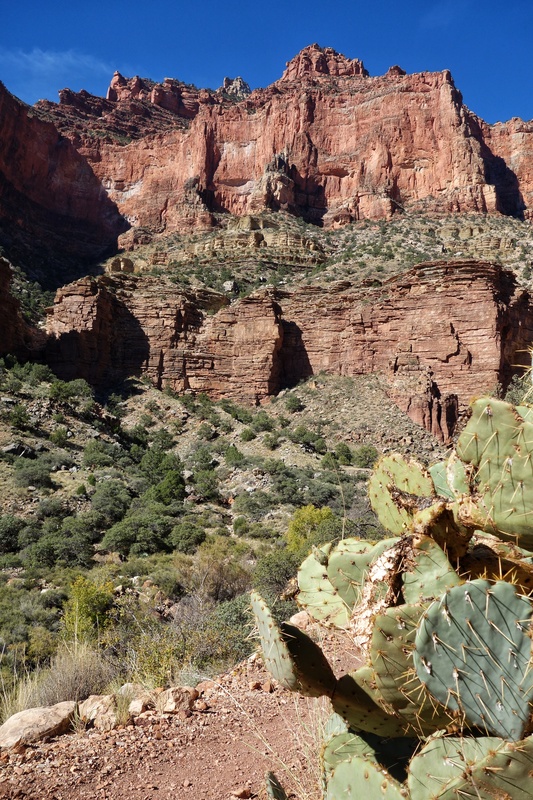 Despite the fact that the Canyon is in Arizona, the North Rim is perched at ~2400m above sea level, where things are just colder. 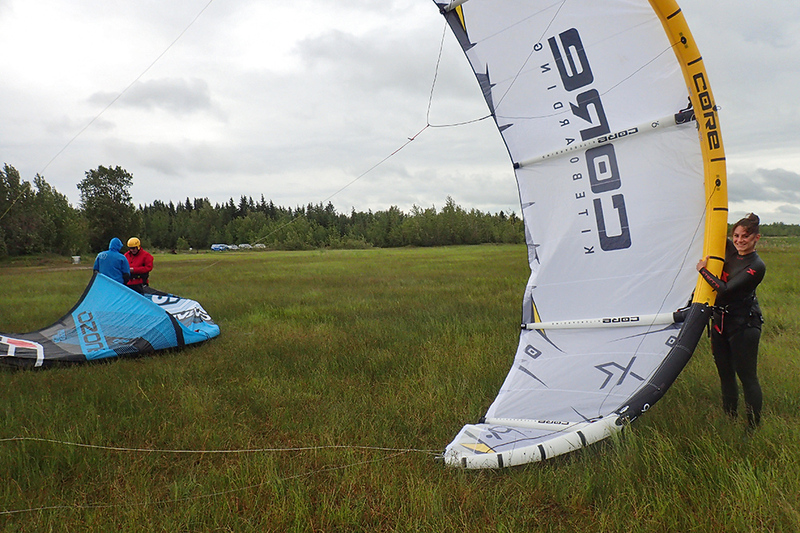 I could feel that the air was less than 10 degrees celsius already and I was losing daylight fast; I had to get out of my sweaty clothes to stay warm. Stiff and ache-y from the effort of climbing another 1500m to reach the North Rim, I was eager to find a place to settle for the night. The North Rim campground was completely empty in an eerie way; not another soul was to be found. The buildings were all locked up, save for the outhouse. In the name of saving weight, I’d chosen not to bring a tent and was planning to bivvy in the open. I debated whether or not to share this next image due to general reception, but for the sake of telling an authentic story, it’s only fair. As I mentioned, the one open building was the outhouse. With four walls and roof, this was certainly the ‘warmest’ structure around, offering refuge from the elements. Since nobody else was around, I figured I’d take advantage of the available shelter from the wind and cold. For the record, it was cold enough that I think the “contents” may have been frozen. There was no odour. Odour would have been a deal breaker. Fortunately I didn’t have a crappy sleep (haha..) and woke up well rested and ready to tackle the whole trail all over again, starting with a 1500m descent. 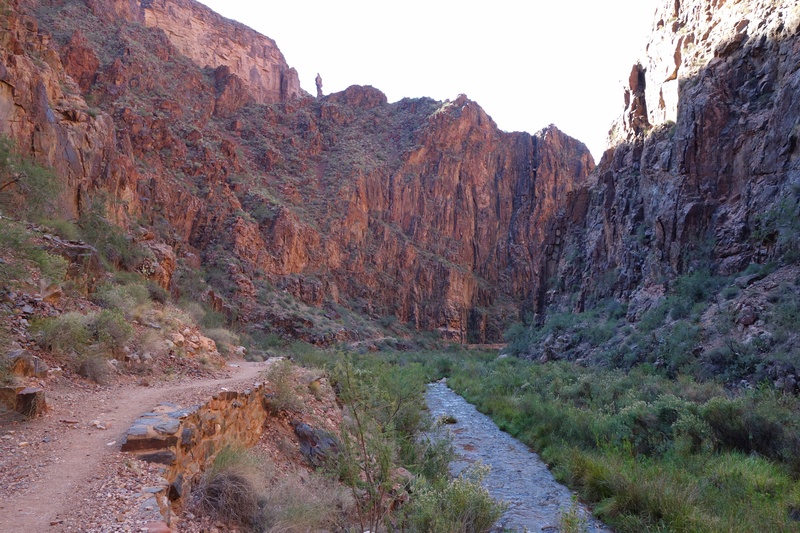 I managed to warm up quickly and run downslope and back into the Canyon easily. 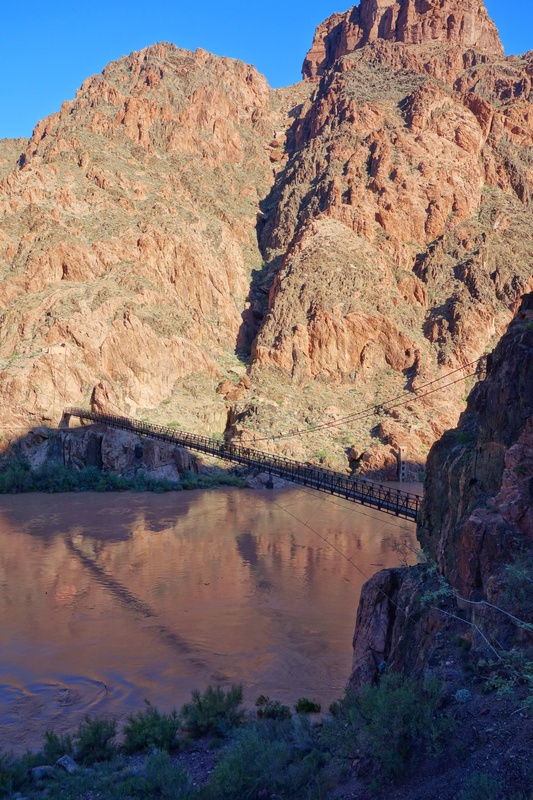 Though the descent back down to the Colorado River was relatively easy and I was able to run/jog/shuffle most if it, I could feel the effort, distance and weight catching up with me. 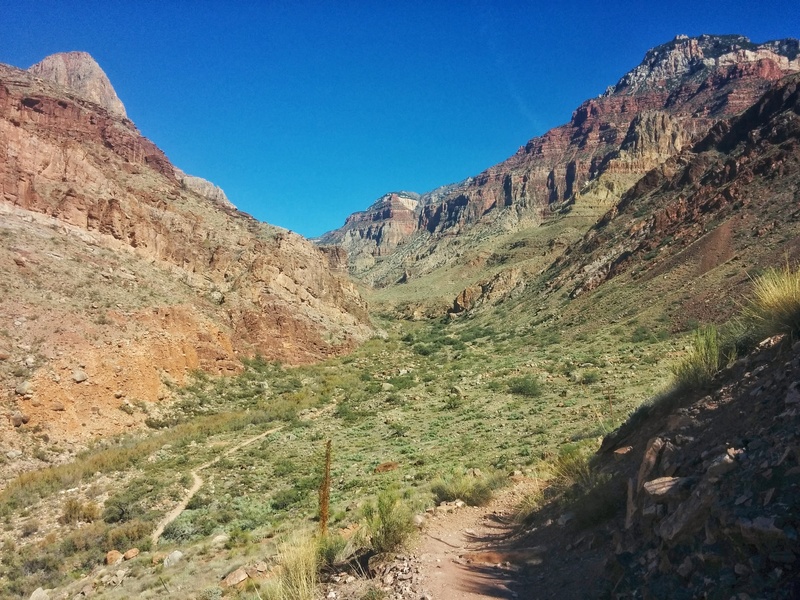 By the time I reached Phantom Ranch my exhaustion had set in, my blisters were bleeding, the desert heat was sapping my energy, and I still faced the prospect of needing to climb the remaining 1500m out of the Canyon. Giving up here was literally not an option – nobody could get me out of the Canyon except myself. During the hottest part of the day my climb began and it was a slow, slogging sufferfest. As much as I just wanted to stop and sit down for rest, I kept pushing myself to continue climbing. Stopping to relax was not going to get me up the Canyon wall any sooner, and at that point I just wanted out. 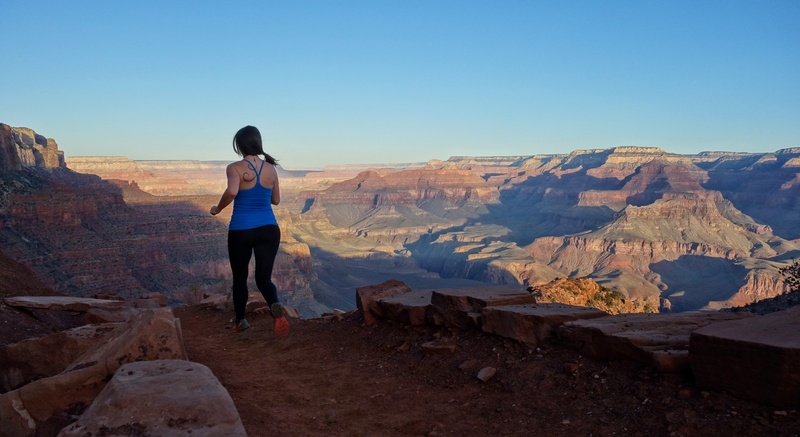 I had to invoke the power of my most useful endurance tool – my mantra – “this is what you came here for.” I undertook the R2R2R to see the beauty of the Grand Canyon, of course, but also to test my physical ability and mental fortitude. It is another conversation for another blog post, but I’m of the belief that all people need to experience some level of suffering whether self-manufactured or otherwise to really appreciate how simple and wonderful everything else in life is or can be. Maybe it’s just me, but I perceive a very real and substantial gratitude when things are tough; a sense of aliveness. I crawled out of the Canyon at the Bright Angel Trailhead at around 4pm on day two of my adventure, completely spent, after another 9 or so hours of effort. Satisfaction and a glowing sense of achievement washed over me. Although I hadn’t done it nearly as quick as some of the runners I aspire to be like, I finished what I’d set out to accomplish. I felt and still feel incredibly appreciative to myself for mustering the strength and resolve to attain my goals, as well as gratitude to those people who helped me. I thank you. 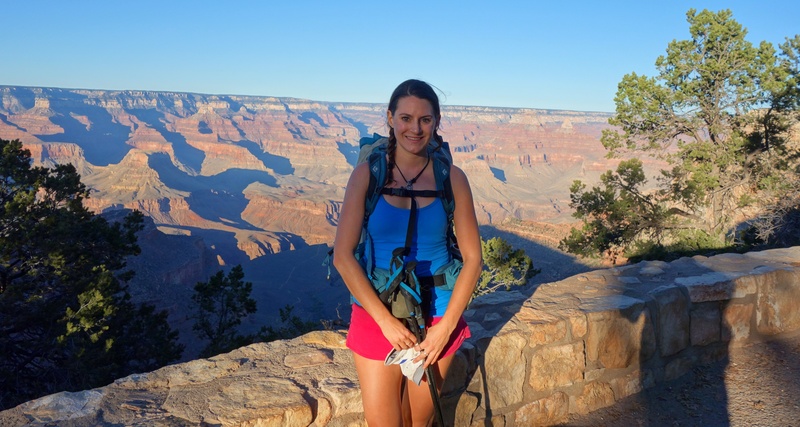 At the Bright Angel trailhead, happy to be finished two epic days fastpacking the Grand Canyon. This is such a cool thing to do that I’ve added it to my ever growing bucket list! 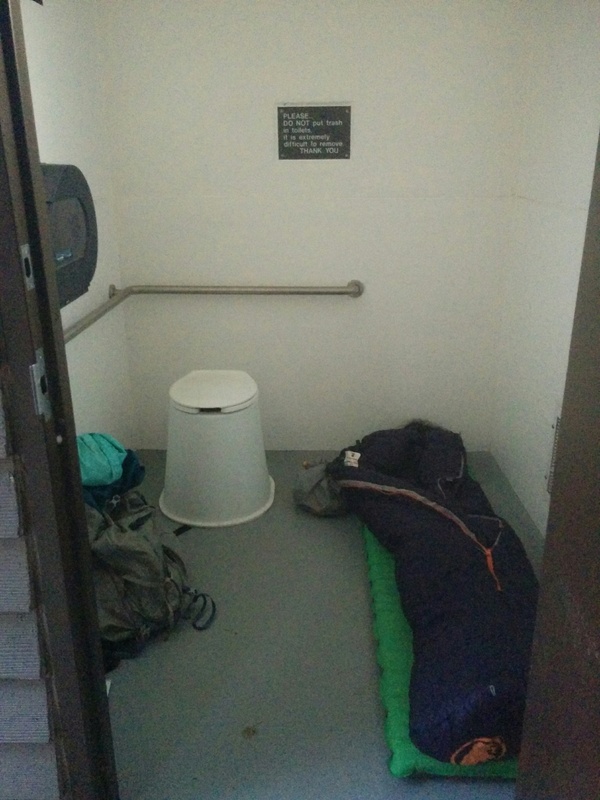 The outhouse camping was cringe worthy but so real, thanks for sharing! !